Zoroastrian scholar Khojeste Mistree, who was in charge of forestation at Doongerwadi, quits citing undue interference from Bombay Parsi Punchayet chairman Dinshaw Mehta. 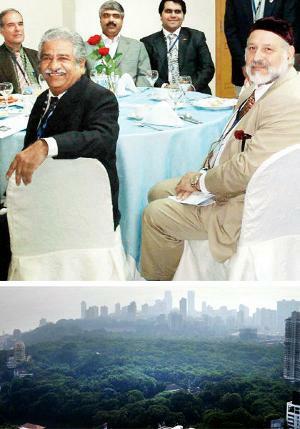 Controversy refuses to leave the verdant environs of Doongerwadi or the Tower of Silence housed on a 55-acre plot in the tony neighbourhood of Malabar Hill. After the recent row over a proposal to build an aviary on the property in an attempt to give a shot in the arm to Dokhmenashini – the traditional method used by Parsi and Irani Zoroastrians to dispose their dead to scavenging vultures – it’s now the thick forest cover shrouding it that’s in the eye of a storm. On Saturday, a Parsi publication printed the contents of a letter written by Zoroastrian scholar Khojeste Mistree, who is a trustee on the board of the Bombay Parsi Punchayet (BPP), to fellow trustees of the apex representative body of Parsi-Zoroastrians. It announced his decision to relinquish responsibility as in-charge of forestation at Doongerwadi, and tree maintenance at the various baugs or colonies owned by BPP and inhabited by Parsi-only residents, five years after he won an election to join the Board in 2008. The letter, which Mistree said he submitted a month ago, holds the BPP staff responsible for the ad-hoc hacking of branches without his knowledge or informing the BMC’s Tree Authority Committee “under direct instructions, I am given to understand, from the Chairman”. “The Chairman wishes to run the BPP as his personal fiefdom where the orders of a fellow trustee are constantly set aside,” Mistree wrote of Dinshaw Mehta. “I do not want to be party to the degradation and de-greening of our various baugs and institutions,” he added. His bigger concern, though, is what he calls the destruction of the ecologically-sensitive wooded hill that houses a variety of flora and fauna, 1317 trees according to a BMC census, and rare species of orchids. To protect the forest which has been battling a termite problem, the Board decided in 2012, to get botanist and plant taxonomy researcher DR CS Lattoo to survey the vegetation. His report submitted in October 2012 termed the area “a forest within the city…rich in diversity of plants, birds.. a great solace.” He advised the Board against the use of termite-beating pesticides, says Mistree. “Even small interventions, such as the one time application of a given pesticide, can have serious and irreversible harmful side effects… termites and other insects and fungi…help convert (dead wood) by decomposition into nutrients essential for the renewal of the forest,” the report said. Choosing to override the opinion of an expert that the Board itself had ironically commissioned, the trustees, alleges Mistree, went ahead with the pesticide treatment. “Which forest in the world have pesticides been used in?” asks Mistree. “You go to a doctor hoping he’s qualified enough to treat you. Why then would you say, to hell with him! I’ll figure the medication myself. Dr Lattoo’s report was vetted by international experts, but the Board chose to blatantly flout procedure. I saw no reason to stick around after they made me redundant,” he adds. The thick tree cover that separates the Tower of Silence, which houses a deep circular well where bodies are left to the sun and vultures, shielding it from view from surrounding skyscrapers, gains importance in the light of the method the Zoroastrian community uses to dispose their dead. Holding fire, earth and water sacred, the community prefers this to polluting natural elements during disposal. The “low disturbance urban forest” is then vital to draw in and help breed vultures, without who the system would fail. “We have employed pest-control earlier too. If Mr Mistree is not happy, it’s his privilege to resign,” says Mehta, challenging Lattoo’s recommendations with those of reformist scholar Dr Homi Dhalla, and Maneck Engineer, who held Mistree’s forestation responsibility before him. “Both insisted we opt for pest control. The proposal was put before the Doongerwadi Committee, and passed by a majority. Perhaps Mr Mistree wasn’t present at that meeting,” he adds. In his letter, and his conversation with this writer, Mistree hints at factionalism within the Board, calling the decision to use pesticides “politically driven”. “It’s not about contrary opinions regarding the environment,” says Mistree. “It’s politics, and a shift in balance of power after a new trustee came on board in 2011,” he adds, referring to the appointment of Muncherji Cama. The philanthropist and MD of Asia’s oldest newspaper, Bombay Samachar came on board after a seat was left vacant in the seven-member trust following the resignation of Noshir Dadrawala. Backed by the reformists, Cama won by a lead of 1,700 votes over his rival Anahita Desai, who belonged to the orthodox World Alliance of Parsi-Irani Zarthoshtis (WAPIZ), of which Mistree is a founding member.